Does everything the other bullets do, at a fraction of the price! The Magic Blender is an entirely new concept in labor-saving devices. Unlike bulky blenders or food processors that are usually taken from storage for specific recipes and special occasions, the Magic Blender is so handy and versatile that you will put it to use every single day. It will let you blend almost every ingredient in 10 seconds or less. The secret to the Magic Blender is it's unique cyclonic cutting process. The specially designed blade and unique bullet-shaped design automatically circulates food back into the blades with so much force and speed that it can do virtually any job in 10 seconds or less. 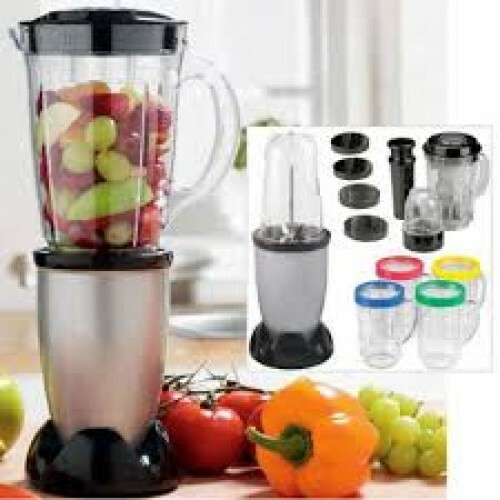 This powerful blender grates, grinds, blends, chops and mixes drinks in high speed to save you time. All you need to do is place your favourite ingredients into the cup, place the bullet cup onto the high-torque power base and press it down to get deliciious smoothies, frosty treats, rich sauces, chopped ice and much much more.